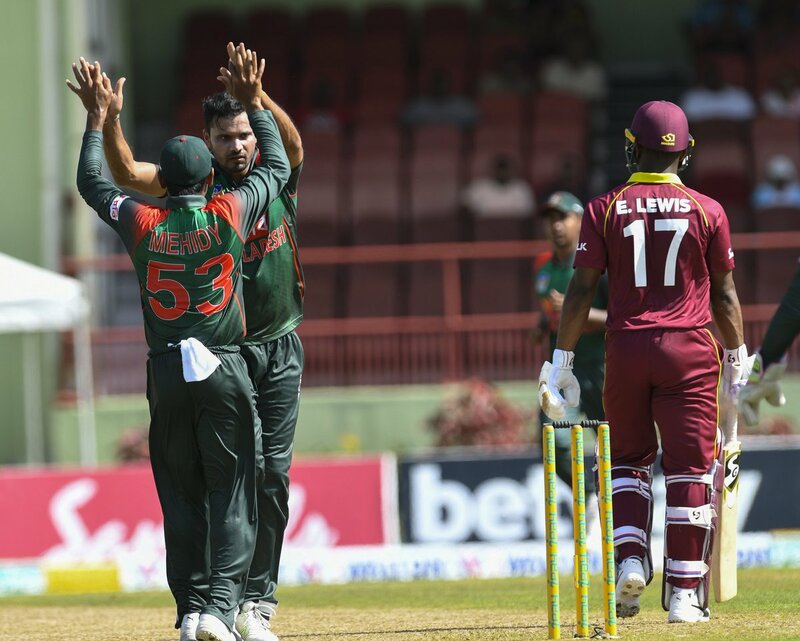 West Indies vs Bangladesh, Second ODI, Guyana. Result : West Indies won by 3 runs. Player of the Match : Shimron Hetmyer. Bangladesh have lost the second ODI against West Indies by 3 runs in a nail-biting encounter at Providence Stadium, Guyana. With this win, the hosts now leveled the series 1-1. After winning the toss, Bangladesh opted to bowl first. Skipper Mashrafe Bin Mortaza gave the first breakthrough by dismissing Lewis on 12. West Indies were reduced to 102 for inside 25 overs thanks to one each wicket from Mehidy, Shakib and Rubel. Then Hetmyer and R Powell made an pertnership of 103 and helped Windies to score 271 in 50 overs. Hetmyer was the last man to be dismissed after scoring 125 off 93 balls. Rubel bagged 3 wickets for 61. Chasing 272, Anamul Haque gave Bangladesh a flying start with his knock of 23 off just 9 balls. Tamim Iqbal and Shakib Al Hasan carried the good start with a 97-run stand. Tamim was dismissed after scoring 55. Couple of overs later, Shakib also got out on 56. But Mushfiqur Rahim and Mahmudullah’s 87-run partnership kept the Tigers in the chase. But after the departure of Mahmudullah on 39, Windies bowlers put more pressure on the Bangladesh bowlers with some tight bowling. Mushfiqur picked up his 29th fifty in ODIs which almost sealed the match before Holder got rid of him on 68 in the final over. Mosaddek and Mashrafe tried but they were able to add 4 runs in the remaining deliveries as Bangladesh manafged to post 268 for 6 in 50 overs. Nurse, Bishoo, Paul, Holder and Joseph shared 1 wicket each. Hetmyer was named man of the match. Third and final match of the series will be held on July 28 at Warner Park, Basseterre, St Kitts.